Dining out is fun and a great social outlet. However, it is often difficult to maintain good eating habits if you dine out frequently. Here are a few tips to help you stick to your health goals without having to give up your social life. Most menus are available online. Pick out your food before your go to avoid snap decisions at the table. If you are hungry upon arrival, you may fill up on the bread basket right away. Eat a healthy, high-protein snack before you go out. Choose clean cooking options over those that are heavy in oils. Look for options that are grilled, steamed, roasted, or poached. 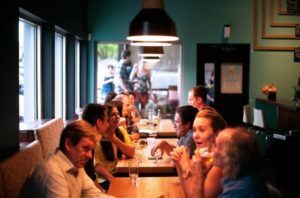 Research shows that people’s eating behaviors can be heavily influenced by others at the table. Choose your meal first. You may even inspire others to choose a healthier option! Digestion starts in the mouth, so chew your food fully regardless of what you order! Sometimes it can be hard to keep track of chewing when conversation is your priority. Remember to be mindful of how much you chew when dining out. Many restaurants have the option to swap out greasy french fries or potato chips for a vegetable option such as nutrient-dense broccoli or a salad. Ask the server if you can substitute your starch! Tomato based sauces will add more vegetables to your diet while cutting out unhealthy fats. Skip out on the extra sugar and enjoy a cup of coffee instead. Depending on where you dine, soup and salad (try to avoid iceberg lettuce) may be some of the healthiest options on the menu. Starting your meal with one or both will allow you to order lighter fare or an appetizer as the main course. Menu options may be labeled gluten-free, vegetarian, or sugar-free. Take a closer look at the meal before ordering. Vegetarian options could be high in wheat, gluten-free options might be high in sugar, and sugar-free options may be high in chemical based artificial sweeteners. Article adapted from Authority Nutrition.